My sweet blog friend Sarah Mae (from Like a Warm Cup of Coffee) recently wrote a very successful eBook called 31 Days to Clean (affiliate link). Not only is it a helpful book, but it has brought in a nice income for her family. 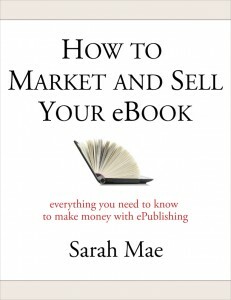 Sarah Mae has just written her newest eBook How to Market and Sell Your eBook - everything you need to know to make money in ePublishing in order to share how she found success in ePublishing. Sarah Mae, listed as one of The Christian Broadcasting Networks Six Women Leaders to Follow on Twitter, is an influential blogger, conference host, and author of the bestselling Ebook 31 Days to Clean-Having a Martha House the Mary Way, which sold over 11,000 copies in its first two months of release. This book is easy to read and easy to follow. Sarah Mae takes you through all the steps of the eBook process. I think the book is best used by reading through the whole thing to get inspired to write your eBook, then going back through it in detail as you work on your book, using all of the resources Sarah Mae has given you. There are so many great tips and links to more information - you get more than your money's worth for sure! Are you curious? Are you ready to write? For more info on the book, stop by the website. To buy the book, you can go here (note - this is an affiliate link, so yes I'll make a teensy bit of $ on the purchase. That did not influence my review - if anything, it shows you how much I like the book because I was willing to sign up to be an affiliate!). ***Giveaway Closed*** Congrats to the winner - Mandy!! But wait! I have an extra copy of Sarah Mae's fabulous book to give away! All you have to do is leave a comment and you'll be entered in the drawing. If you spread the word on Twitter, Facebook, or any social media of your choice - feel free to come back and leave another comment telling me what you did for an extra entry! I'll draw the winner on Monday 7/11. Disclosure: I did receive a free copy of the book and offered to give an honest review. I also received an extra copy to give away. My opinions are my own as always! I have also signed up as an affiliate for Sarah Mae's books because I happen to think they're great books! Love Sarah Mae and would love to win this book! From what I have heard, per your review and several others, this book is fantastic - even for those of us who *only* write blogs, not books. It seems to help spark ideas and thoughts that we might otherwise dismiss! :) Love that!